The objective was to familiarize people with the lives of Muslims and give them a chance to witness them worshiping in the most sacred month of the year. In Ramadan, the 9th lunar month, also called the month of the Quran, Muslim adults fast from before the break of dawn until sunset, abstaining from food, water and any intimate physical activity. In North America, the fast can range from 15 to 18 hours. 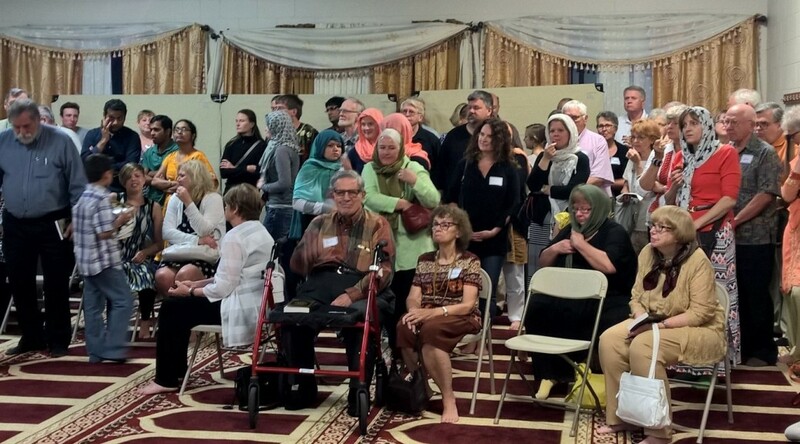 In the “Night of Power” event, a group of Muslim families invited their neighbors, friends and colleagues to witness a fast-breaking meal together. “In a way, it was intimidating to ask people to join. We did it because we want to share our faith. Islam is a beautiful religion and people will witness that for themselves in the heart of our place of worship,” said Mona who invited her colleague. Guests were greeted at the parking lot with “Assalam Alaykom” the Arabic for “Peace be Upon You” as they entered the mosque. They were first guided to the praying area, where they took off their shoes and attended a presentation on “Islam and Muslims”. This was organized by the Islamic Resource Group (IRG), an educational outreach organization. While it was never instructed, some women came wearing a veil on their heads as a “way of being respectful”, they expressed. The presentation was powerfully and knowledgeably delivered by ten Muslim youth, students ranging in age from 14-16. One visitor, Alice, commented that it was so powerful seeing people at such a young age, feeling so confidently about their religion and able to present about it. Some of the questions that followed the presentation addressed misconceptions and a couple of “elephants in the room”. One woman asked, “Why are Muslims killing Christians?” Tamim Saidi, IRG speaker and correspondent of the “Interfaith Iftar”, answered that fighting in Islam is only allowed against aggressors, and supported that with an explanation of the Quranic verse (5:32) that instructs Muslims that whoever kills an innocent soul as if he/she killed an entire humanity and whoever saves an innocent soul as if he/she saved an entire humanity.” Furthermore, Saidi added that the same question could be asked, “Why are Christians killing Christians? And why are Muslims killing Muslims?” Violent groups committing crimes in the name of religions are false. Everybody joined at the dining hall where they filled up their plates with delicious Middle Eastern cuisine: rice, salad, hummus, kebabs, flatbread and baklava. The atmosphere was more like one big family. “Despite the loud crowd there was peace in the room,” said Vito. “We believe it is important in our ever changing and diverse community to learn and understand other cultures and religions. We are Presbyterians who enjoy the opportunity to learn. We’ve also attended a local Hindu celebration. If our world community is ever to attain peace, each person has a responsibility to reach out to those of different beliefs,” said Barbara. “I was blown away by what I witnessed”, said Teresa. “I now stand for Islam,” she added before she walked to the fashion corner where she tried out a traditional Lebanese dress and topped that up with a head scarf or hijab. The heavenly “Night of Power” is a very special night for Muslims. The prophetic sayings state that it takes place in one of the last 10 days of Ramadan. On that night, prayers are answered, a person’s provisions are divided, and angels come down asking forgiveness for people. “It is peace until the break of dawn,” says the Quran (97:5). Muslims do not know when it will take place, so they choose to spend these last few nights pleading, praying and fasting. Some even sleep at the mosque for the whole 10 days, a kind of spiritual yearly vacation. What people witnessed, at this event, was a different kind of power. A night of peace, compassion, and understanding. People from many faiths stood together as brothers and sisters in humanity, learning from each other and experiencing a profound earthly version of the “Night of Power”. Hanadi is an award-winning public speaker and writer. She recently received the Eden Prairie Human Rights award 2016 for her efforts to dismantle misconceptions about Islam and build bridges of unity. She has been featured in the Star Tribune and has had articles in the Huffington Post, American Diversity Report, MinnPost, Engage Minnesota and recently The Guthrie Theater in Minneapolis, Minnesota. Hanadi is currently pursuing a Master’s degree in International Leadership at St Thomas University. Before coming to the U.S., she was an award-winning creative and communication specialist working across different media, she has been on numerous award show jury panels and has covered the Cannes Advertising Festival in 2004.